To my right as I enter the exhibition is a large dark brown-coloured rectangular object fixed to the wall. My eye is drawn to white bow-tie shapes that float-hover-drift on a grey surface, offshore of a nasal-peninsula-chef’s head emerging from beneath a black sheet. ‘Bow-ties and head. configuration with lost chef, 1925/1950.’ sits off-centre on the brown rectangle. Reflected images of people move slowly into and out of view. I see other things, reflections of sculpture on a plinth, the whiteness of a wall, a piece of exhibition text, and myself. The work is contained in a transparent box set into the mount on which it is fixed. It is placed off-centre to accommodate a seemingly purposeless small purple panel outside the box. In a standoff of composition and counter-composition, thesis and antithesis; an uncomfortable synthesis arises from the jokiness of the bow ties and head, the sharp -elbowed, rigid form of the display-case counter-composition and the a translucency of reflected virtual-people. A spatial melding arises between reflection and solid; I look into a virtual space at virtual images and at an artwork in a real space, a conflation whose simultaneity DADA would recognise. But the show is more than the work. The expectation is that the glass cases fulfil a role of transparency. But to access the work we collude in a corporate blindness to its means of presentation. And we are aware intuitively that there is uncertainty concerning the limits of a work not so much presented by but embedded in its display. Through this embedding a third order of object is created that inhabits both the gallery space and the wider world. 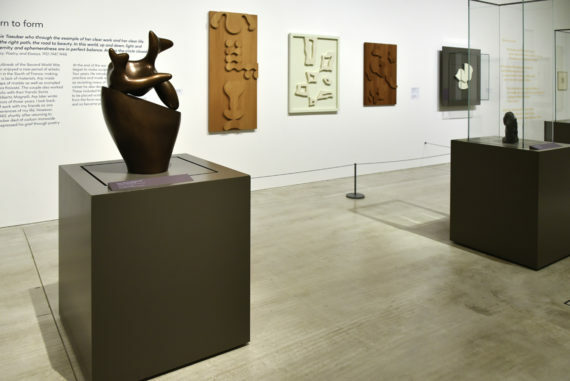 Further into the exhibition, tall transparent rectangular boxes appropriate Arp’s sculpture onto smooth brown pedestals and into a new whole with its own proportions and counterpoint of mass and volume. The rigidity of the glass case directs me as I move through 90 degrees to obtain views unobstructed by its corners. There is no ‘getting away’ from the integration of glass case and piece. I am outside looking in as the work is, as it were, inside looking out. We both are constrained. The glass creates distance as it permits visual contact, echoing the shopping mall’s sparkling possibilities, but now replete with a suspended promise of consumption, a glimpse of spectacle. Sign of consumer goods and the shopping mall, where expensive commodities tease and cheap ones pretend, the promise of the glass case is that this separation embodied in our experience of its contents will be only temporary; the work, dressed in contemporary clothing, becomes a thing of our time in the continuing process of the commodification of everything. 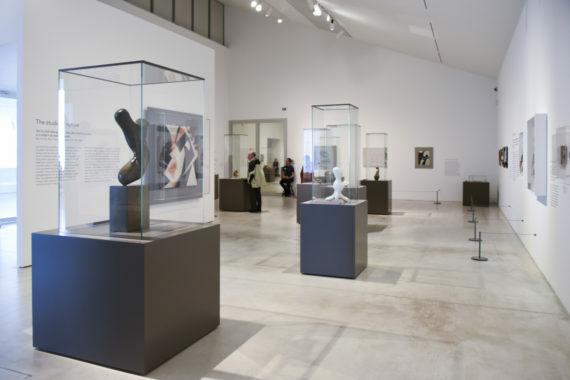 Notably, on Turner Contemporary’s website, the presence of glass cases is acknowledged. In filmed dance sequences in ‘Amphora:The Making Of’, a dancer’s movements reflect in the glass in a simultaneity of rhythm, her image at points subdued by filming through a translucent veil of reflected light. Inspired by the impact on Arp of the premature death of Sophie Taueber-Arp the film poignantly encapsulates the distancing, rejecting effect of the glass in a metaphoric statement of absence and presence in death. But ironically in the ‘real’ performance of ‘Amphora’ in the gallery lobby, the dancer performs on a stage and the direct, potent partnership with the works-in-glass is lost. If there is a metaphor for our physical relationship with Arp’s work, it is one of dance. 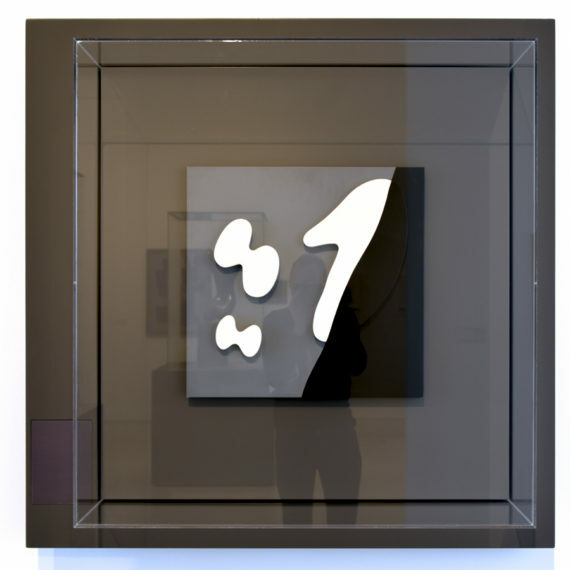 Those pieces which have no encapsulating glass or perspex make the point. We breathe with them; their surfaces are ours also. The space between us is space of connection through which we synchronise and reciprocate; the contrast between our experience of those free works which stand in a direct spatial relationship with us and that of the works ‘displayed’ is palpable.